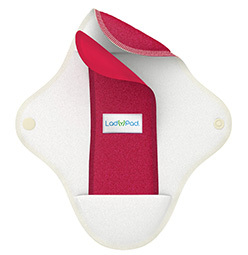 LadyPad pantyliners are available in 5 sizes and 3 types. 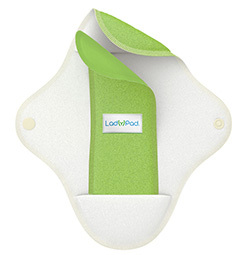 LadyPad are machine or hand washable. Wash your new LadyPad once before using. You can expect to last for up to 3–5 years following care instructions. Zip-lock laundry bag for washing LadyPads. The print side of LadyPad touches your underwear. Fold the wings over the crotch and close the snaps. 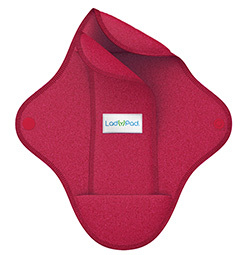 Incorrect placement may result in reduced comfort and performance of the LadyPad. please note that Liners are not intended to be worn without Pad. Place one of the inserts inside the holder. LadyPad are a perfect choice for incontinence. Confidence in textile. Tested for harmful substance (according to Oeko-Tex Standard 100).